I could look at this image for hours. 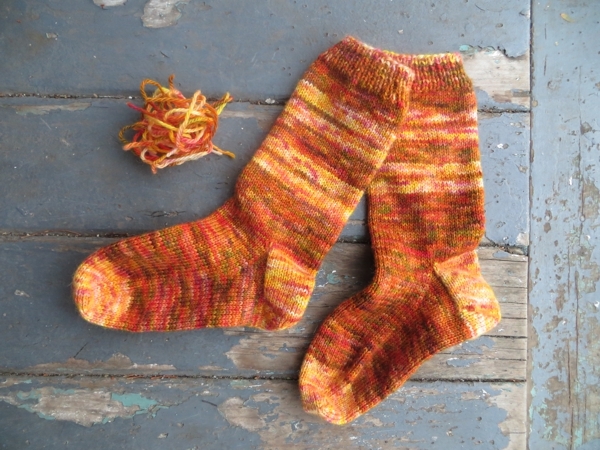 These socks look so nice, don't they, so perfectly easy and effortless and orange. Sigh. Actually the finishing is a lot less fun than that. Because remember all those stripes I put in to make the socks just a little longer this time? Yeah. Ends. I didn't run any of them in. A while ago Pete gave me this super pretty tray to use for, I don't know, putting a mug of tea and plate of cookies onto the ottoman, like in the magazines. As you can see, it's been pressed into service holding all the socks and the scissors and darning needles and scrap yarn so I can just set it on my lap and run in a few ends as I have a spare minute or two to sit down and be bored. 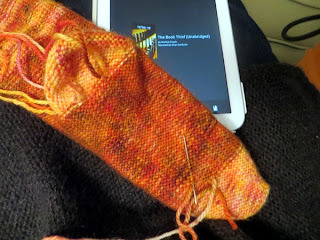 I'm trying to concentrate on how many days of laundry-free warm feet all this darning needle stuff is going to mean when I'm finally done the work, even before I get around to finishing the knitting on the other three pairs either on needles or waiting to be cast on. Also, I'm listening to audiobooks. There's no point in trying to watch a movie doing this, and nobody seems to want to hang around to talk to me while I'm at it either, so audiobooks are my only friend. Overall they do make the job bearable, so thank you audiobooks. Also thank you Trish, who told me about this neat trick for running in ends on stocking stitch such that they don't show on the other side. Basically you take your needle up on an angle through the purl loops of several successive rows; if you look at the other side and see the thread, you've got it wrong. Pull the yarn back out and try again from another angle. 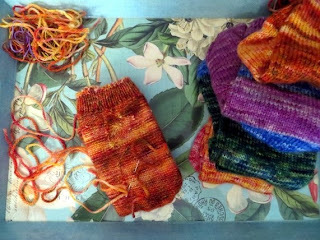 I find if I slip the hanging yarn under 8 or 10 stitches in one direction, then off in another zigzaggy angle, and finally in a third, I feel confident enough in its security from hole-making to snip off the end. 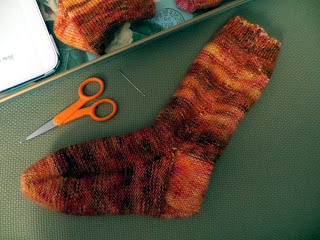 And best of all - if you do this often enough, you get a finished sock!! 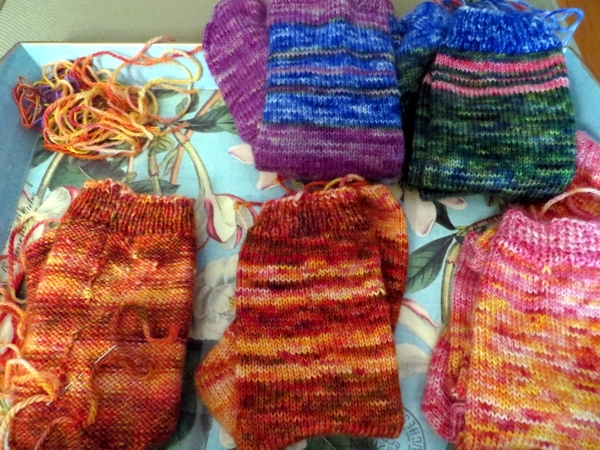 Yay finished socks. And even more yay a ton of finished socks... if only I hadn't decided to knit all those gift cowls in the middle of a cold snap. Oh well. It's a journey, not a destination, right? And if you'll excuse me, I have to go put in a few more miles. Too bad we live so far apart, I dont mind kitchenering toes or sewing in ends. Sock knitting for me though is something I do because its practical, not because I love it. If we lived closer we could work together to be a sock knitting maschine! UmmRania, the weirdest thing happened last night while I was running in more ends: I noticed I was doing it *on purpose*! 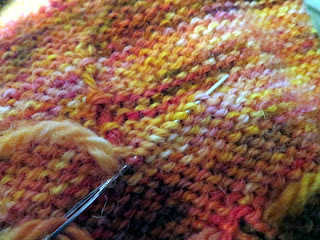 I could have been knitting or at the very least watching the very interesting program on TV but there I was running in ends, instead. AND I kept on doing it even after it occurred to me that I should really be doing other things. I think - is this possible? - it's growing on me!